On Friday, April 27, Crime Stoppers of Halton will be at the Georgetown Market Place raising funds for our programming. 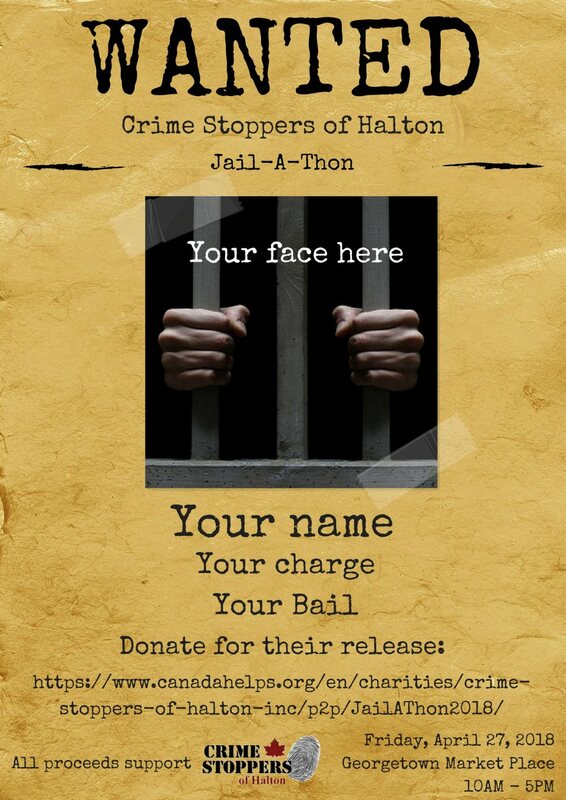 The Jail-A-Thon is a one-day event that requires the support of volunteers willing to be our jailbirds at the event - who will then be released once their "bail" has been raised (fundraising is actually done in the weeks leading up the event)! We are seeking jailbirds that would be able to raise funds from their friends/families/coworkers and supporters in order to be released on "bail". Participants will be given a personal fundraising page to send to their supporters. All donations raised will receive a tax receipt (through CanadaHelps.org) as soon as they make their donation online. If you are interested in being one of our jailbirds, please send us an email to get started right away! Though the event takes place from 10am-5pm, jailbirds will only be held for 15 minutes while their "bail" is raised - complete with a judge and prosecutor! To find and donate to a specific jailbird, please visit this page.